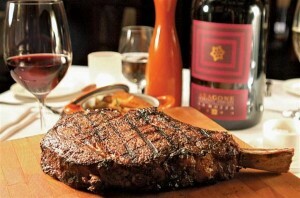 Carnevino isn’t just one of the best steakhouses in Las Vegas; it might be the best steakhouse in the country. It also might be, on any given night, the best Italian restaurant in Las Vegas. 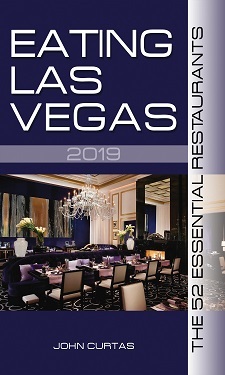 Throw in a killer cocktail program, a warm, spacious and inviting lounge, and a world-class wine list and you have the fifth most essential restaurant in Sin City. Its sirloins, porterhouses, and rib eyes have caught the attention of Black Angus aficionados the world over, and meat lovers now flock here to get them. There may be a certain civic pride behind my calling Carnevino the greatest steakhouse in America, but I’ll stack the following arguments up against any emporium of prime anywhere. First, there’s the meat: all-natural, hormone-free, and hand-selected by Adam Perry Lang—a professional “meat forager” and a man who Rachael Ray (along with many others) has credited with raising the industry standard for the beef we eat. In addition, all steaks are dry-aged in Las Vegas by the restaurant itself—not by some middleman—in a climate-controlled, 2,000-square-foot meat locker. This process achieves otherworldly tenderness and taste after two to eight months—the prime amount of time for these beauties and “riserva” cuts to reach their peak, according to Chef de Cuisine Nicole Brisson. Finally, no other steakhouse in America has such a hands-on, intensive-care selection-and-aging process, and no other purveyor of prime can stake a claim to also being one the great Italian restaurants anywhere. Thus does this kitchen also dazzle with everything from house-cured salumi, such as coppa, lardo, and lonza, as well as a variety of pastas as diverse as ricotta and egg ravioli, to a black fettucine with crab, jalapeños, and shallots. Put these together with the purest Pennsylvania free-range veal from Marshal Farms, as well as Heritage Foods pork, and you have a steakhouse of uncommon sophistication. The wine list is just as impressive as the steaks are … and just as expensive. Purists might kvetch that grilling a slab of animal muscle or prepping pasta with pancetta and pecorino doesn’t require the same precision as the pristine preparations purveyed at Twist or Raku, but for all of them we have but two words: Shut the f*ck up. Favorite Dishes: All House-Cured Salumi; Carne Crudo Alla Piedmontese (Steak Tartare); House-Cured Pastrami; Grilled Octopus; Shrimp Alla Diavola; Black Fettucine With Crab And Jalapeños; Bucatina All’amatriciana; Ricotta And Egg Ravioli; Grilled Sweetbreads; Veal Chop; Osso Buco Alla Milanese; All Steaks. Hot Hostess Ary Wonders Where CARSON KITCHEN Will Be in the 50 Essential Restaurants of Las Vegas? I love Carnevino, but I have one minor quibble about your piece: “Shut the f*ck up” is four words. One more quibble: Rachael Ray, really. I could care less what Rachael Ray thinks about anything food related or otherwise. ELV responds: This is not the first time we have heard of up-selling insults at Carnevino, but it has been years since the last one, and we have sent dozens, if not hundreds, of people there without complaint. Eating Las Vegas would be most interested if others had the same experience as Hector, AND would be willing to post their comments — anonymous or otherwise — on this site. Was at Carnivino’s last night. Had a great experience. No up sell from any staff last night at all. I must speak about the steak though. I had a bone-in ribeye for one ($95) It was great but like the last 3 times I have been here the steak was served almost at room temp. It was cooked to my liking, m-r however I like a steak that has at least some surface temperature when it is served. Not sure if anyone else has noticed this with steak meals served here. Just spent 10 days in the Grove north of SF drinking some incredible wine so I put a little pressure on the Som. He did a great job picking me a super tuscan that fit our meal very well at a decent price point considering the venue. GD…..the panna cotta desert was f…..ing amazing! Carnivino’s deserves to be in the top 5. …well it gets better…first I would like to remind people that when I use the euphemism up sell- I actually mean the server delivering food that was not ordered…noboday at my table ordered truffles, the oleaginous server just started hammering us…and like I said I have heard that before….so…. John, you should ban these Yelp tards from the site. Particularly when it’s someone who appears to be riding on the coin of his high roller friends and not the one who’s paying. He didn’t even comment about the food or wine, just whined. Personally, I’ve always had a great meal at Carnevino and B&B. Nah, don’t ban the Yelpers. Educate them, debate them, let them learn a thing or two about a thing or two. I’ve always had fabulous meals and experiences at Carnevino and our dinner there last November was one of my most memorable. I don’t remember his name, but our waiter was a bearded gentleman from Brooklyn–exceptional old-school service. The measure of a great steakhouse isn’t just the meat, it’s the side dishes, like the grilled octopus, lobster salad and the aforementioned lardo–pig fat so silky that I thought of slathering it on something other than bread. For those of you who haven’t savored the riserva, call Chef Nicole and order one, but be prepared. It’s got a bit of a funky, barnyard, meadow, grassy, mineral aroma, yet a true, deep beef flavor. I laugh at the astronomical prices of the Wagyu and Kobe beef that is shilled in Las Vegas. It’s not worth my money nor does it have the intense flavor of the riserva. And should you be so bold, request that the amaro cart be wheeled tableside. Leave the car in the parking garage and take a cab home. Must disagree on this one. You forgot to mention the overly loud and obnoxious iPod playlist of Mario’s blaring over your meal. Also, I think I know how to cut my own steak. Thank you very much staff for letting all the jus from the steak run out and get cold sooner. All for $700 for 4 with no wine. WOW!